Researchers at Carnegie Mellon University have developed a 3D bioprinter by modifying a commercially available 3D printer. Led by Adam Feinberg, associate professor of materials science and engineering and biomedical engineering and a member of the Bioengineered Organs Initiative, the team released its research under a Creative Commons license to encourage others to build their own as well. "Essentially, we've developed a bioprinter that you can build for under $500, that I would argue is at least on par with many that cost far more money," said Feinberg, according to a CMU news release. "Most 3-D bioprinters start between $10K and $20K. This is significantly cheaper, and we provide very detailed instructional videos. It's really about democratizing technology and trying to get it into more people's hands." 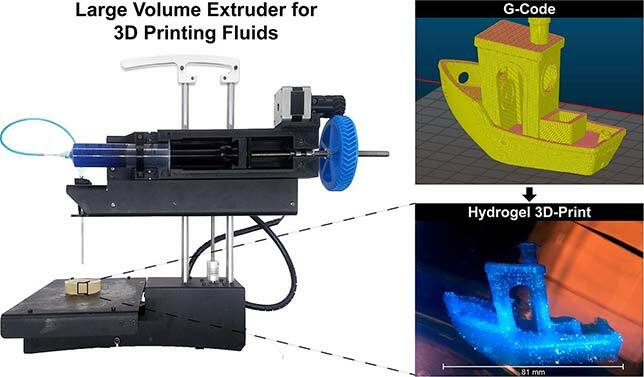 Feinberg and his team used a Printrbot Simple Metal 3D printer to build their large volume extruder (LVE) bioprinter, but said their modifications should work for many desktop fused deposition modeling (FDM) printers. Additionally, many of the components needed for modifying the printer can be 3D printed, reducing cost and allowing for greater ease of modification, according to the group's paper. In addition to improvements in cost, Feinberg said his team's device allows for larger-scale printing and greater precision than many commercially available bioprinters. "Usually there's a trade-off," said Feinberg, according to information released by CMU, "because when the systems dispense smaller amounts of material, we have more control and can print small items with high resolution, but as systems get bigger, various challenges arise. The LVE 3-D bioprinter allows us to print much larger tissue scaffolds, at the scale of an entire human heart, with high quality." The full paper is available at sciencedirect.com.